Author Tim Kreider paints an earnest yet humorous portraits of many life experiences in his new book We Learn Nothing: Essays and Cartoons (Free Press, 2012). Kreider spent fifteen years as a political cartoonist, developing an avid cult following. 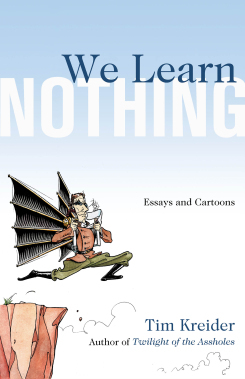 In We Learn Nothing, he confronts life’s knottiest and intimate issues via a collection of essays and cartoons. He expresses thoughts some of us aren’t brave enough to openly discuss with flair and wisdom. From etiquette of “unfriending” Facebook friends to drinking to unrequited love to being outed as a “moby” during a Tea Party rally, Tim Kreider gives a no-holds-barred perspective with eloquent language. If readers learn at least one thing from We Learn Nothing, it’s channeling our darkest fears of the human race while appreciating Kreider’s hilarious, yet brutal honesty approach – from a neck stabbing which nearly killed him to outlining differences between romantic gestures and outright stalking. There’s lessons to learn from We Learn Nothing, yet the book is a delightful read that makes us all think.